Yesterday I received this surprising and wonderful news from Luise Pattison of The Book House in Thame (our wonderful local independent bookshop). On Tuesday I had a class of 38 children in year 4 from a local primary school, who came for an hour of talking about books, bookselling and story extracts. We had a fantastic time, and I read them bits from lots of new titles, telling them at the start to listen very carefully as at the end I wanted them to vote for the book they had enjoyed the most, and I would give them a copy for their classroom. 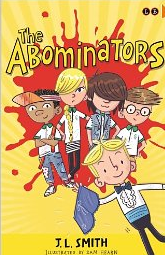 “The Abominators” pooled 26 out of 38 votes (HOORAY!!!!) and so a copy duly went back to their classroom. After school, several children came back with parents and bought a copy, one little girl even paid for the book with her own money, as her mother said she had to wait for Saturday if she wanted her to pay for it – and she wouldn’t wait!!! Their teacher (who couldn’t come) said they hadn’t stopped talking about it, and I asked her if she would like you to visit if that were possible – the answer of course was a resounding ‘yes’!